Professor Thevamaran’s laboratory focuses on advancing the fundamental knowledge of process-structure-property-function relations in structured materials and creating innovative structured materials with extreme mechanical properties. Recent advancements in material fabrication technologies allow us to control the physical properties and the geometry of constituent structural features, and their organization across different lengthscales to develop structured materials with superior bulk properties for desired applications. 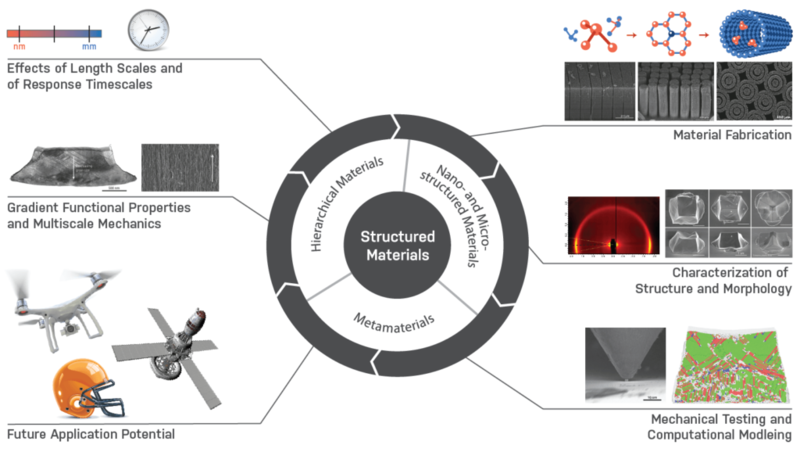 This new approach blurs the boundary between a material and a structure, and enables the creation of structured materials with remarkable properties that are not readily found in common materials. Successful development of such materials with superior bulk properties requires a thorough fundamental understanding of material behavior over multiple lengthscales—from nanometers to several millimeters—across different response timescales—from nanoseconds to several minutes. We use various synthesis techniques to fabricate structured materials with optimally tailored constituent features in multiple lengthscales, and use a variety of mechanical characterization techniques to investigate their responses under different external loading conditions—from quasistatic to highly dynamic. We also use in-situ high-speed microscopy, scanning and transmission electron microscopy, and X-ray scattering techniques to characterize the samples’ structure and morphology as well as the different modes of deformation that occur during external loading. The key fundamental understanding developed in these studies will enable us to develop structured materials with superior specific properties for extreme applications such as protecting humans and engineering systems from impact, shock, and vibrations, and developing ultra-strong and -tough microelectromechanical systems, robots, biomedical implants, and surface coatings. Thevamaran Lab wins the University of Wisconsin-Madison’s 2018 Fall Competition that will support our research on high-strain-rate deformation of nanostructured materials for a year. Our lab research on nanostructured metals is featured in the September issue of the New Scientist–World’s most popular weekly science and technology magazine that is published from UK since 1956. We had a research lab party by the lake Mendota–catching gorgeous sunset before it becomes cold in winter. We are always looking for talented and highly motivated students interested in the research focus of the Thevamaran Lab. If you are interested in joining our laboratory, please send a brief email explaining your research experience and interests along with your CV to Professor Thevamaran. To join Thevamaran Laboratory, students may apply to the PhD programs in any of the three departments: Engineering Physics, Mechanical Engineering, and Materials Science and Engineering. Feedback, questions or accessibility issues: thevamaran@wisc.edu.